I love technology. I also love organization. When you combine the advancements in technology with the ability to organize your finances I think you have a win-win scenario. Let’s take banking for example. All of my bank transactions are handled online or automatically. I used to hold checking and savings accounts at a brick and mortar bank but a few years ago I closed them and opened accounts at the same bank that holds my brokerage account. There have been HUGE advancements in banking technology in the last few years. When I received checks in the past I had to take them to the bank or mail them in prepaid envelopes and wait a few days for them to show up in my accounts. These days I have an iPhone application that lets me snap a picture and see the funds immediately. If I have a problem or question I can call the bank 24 hours a day and ask all sorts of questions and I can use bill pay to schedule and pay all of my bills. My online account now provides the ability to link my credit card accounts. I am automatically notified when a new card is due and with a gentle email reminder I never miss a payment. I almost never write checks by hand anymore. My bill pay list includes over 100 people that I’ve paid for various goods and services over the years. I simply enter an amount and a date and rest assured that the bill will be paid. When I receive similar services I don’t even need to look up addresses or phone numbers. All of the details are listed right in my bill pay address book. Rather than receiving credit card bills or bank statements in the mail I now read them all online. It’s so easy to track spending when you can download a monthly credit card statement and review the transactions line by line. My husband and I use Gnucash to categorize and track our expenses. Each month we copy and paste data directly from our credit card statements to our spreadsheets. 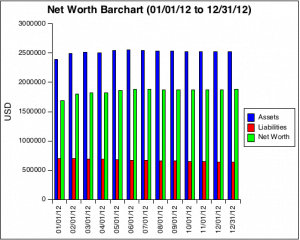 We can generate charts that display all sorts of information from income and expenses to net worth bar charts. 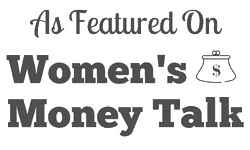 These provide us with snapshot views of our finances in mere seconds. I also generate an expense pie chart to determine where all our money is going. As I mentioned in the early post it helps us visualize where we’re spending money and ultimately helps us figure out what to cut back on. The majority of our money is spent on mortgages, charitable contributions, utilities, food, utiliies, cars, insurance, medical expenses and our rental property. Some people use Quicken or Mint to track their money. We’ve chosen Gnucash, but the capabilities are similar. My suggestion is to find a tool that you find easy to use. If you find it cumbersome you won’t track your money. If you leave a job don’t forget to roll your 401(k) into an IRA. It’s a lot easier to move all of the money into one bucket then to try to maintain money in different accounts at different banks. My dad is famous for opening up accounts at various banks to earn bonuses. You know the type open a savings account and earn $100, move your direct deposit to an account and earn an extra $300. Unfortunately, this leaves his finances in complete disarray. He has to manage a few hundred dollars at one bank and a few hundred at another. When you have ten or fifteen accounts this can get rather tricky. My husband and I keep all of our money in the same place. When we log in we can view an instant snapshot of exactly how much money we have. My husband and I are very open with one another. If you and your spouse have a similar relationship, (I hope you do), I suggest setting up power of attorney rights on all of your accounts. With this paperwork in place I can view all of my husband’s accounts online including retirement accounts that I am not a joint member of. My husband can do the same. If you aren’t comfortable with technology you should start small and try one thing at a time. Start with learning how to log in to your online accounts. Then move all your money to one bank so you can view all accounts at once. If that goes well link credit cards to your bank accounts so you receive email notifications when bills are due and start to pay bills online and on time. Once that’s in place try your hand tracking software like Mint, Quicken or Gnucash. While it’s nice to see the numbers it’s even better to view them in pretty graph form.